That is probably the longest post title I ever wrote! 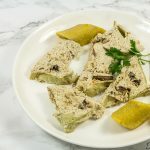 Well, the post title is this way because this Cameroonian plantain porridge is so loved among Cameroonians that it has been nicknamed in many ways. It is called “born house planti”, “porridge planti” or “turning planti.” There’s even another version known as “sese planti“. By the way, planti is short for plantain. You know, when you love a meal so much, you give it a nickname. For example, Spaghetti Bolognese becomes Spag Bol. Pounded Yam becomes Poundi. Plantain becomes Planti. Maybe I should nickname coconut, “cocoo”. What do you think? Let’s talk about this insanely delicious meal, which also happens to be very culturally significant. 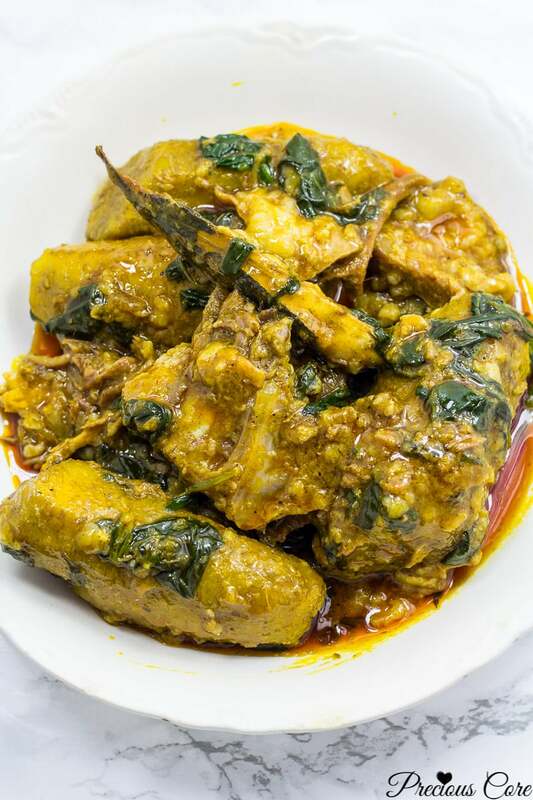 It is a one-pot plantain dish, cooked with palm oil, spices and some form of leafy greens. And by some form of leafy greens, I mean bitterleaf which is traditionally used. But I substituted that with spinach due to the gross unavailability of bitterleaf in my life at this time. Actually, scratch that. I have bitterleaf in my kitchen but it is dried and lifeless. So I’d rather go with fresh spinach. This “porridge” is not a porridge as known in most parts of the world. A porridge is actually a dish made by boiling ground or crushed grains or starchy plants. But for some reasons, West African call one-pot meals like the one in this recipe, porridge. So if you were confused as to why this is called “porridge”, hopefully this clears the air for you. This Cameroonian plantain porridge is so tasty – literally finger-licking good and so easy to make. You know, the dump-and-go kind of cooking which I love. 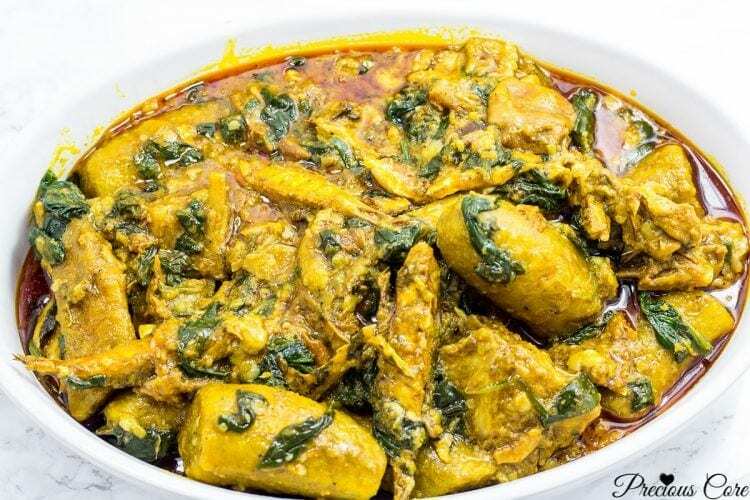 This version is infused with smoked fish, goat meat and cray fish. In other words, come to mama! 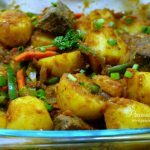 The meal is colloquially called “born house planti” in Cameroon because it is usually prepared when a woman has a new baby. I have a post here on the blog detailing the story behind the meal and the cooking procedure with step-by-step photos. It is an interesting one. Click here to view it. 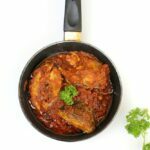 You only need one pot and it is ready in no time! 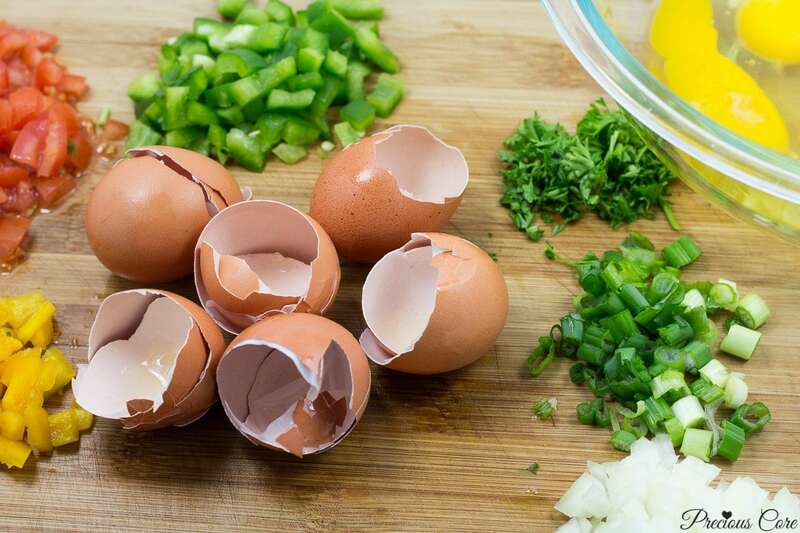 It is perfect for those days when you do not want to spend a lot of time in the kitchen. I put together a video on my YouTube channel showing you how to make the most amazing pot of plantain porridge. 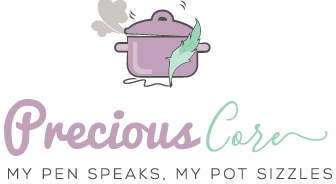 If you are not subscribed to my channel, click here to subscribe so you do not miss any of my awesome cooking videos! 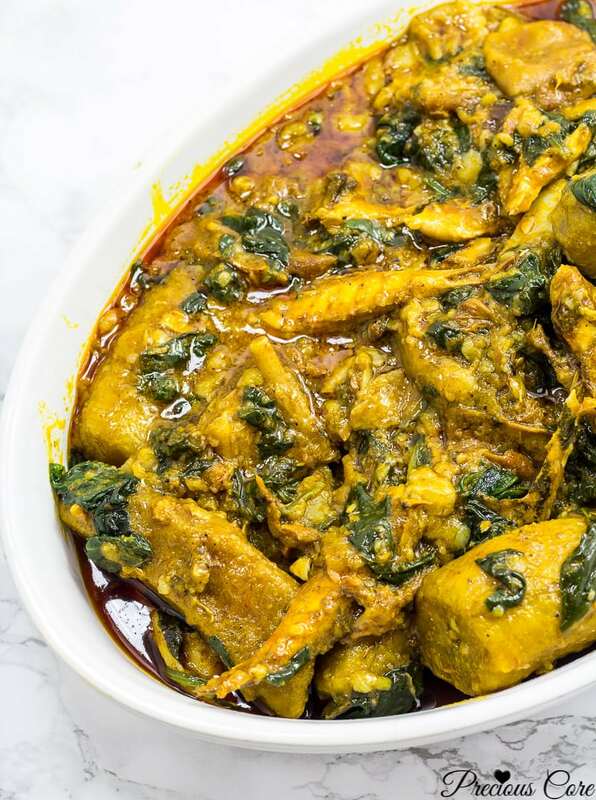 This is a one-pot Cameroonian dish made with plantains, palm oil, smoked fish and other ethnic flavours. Traditionally, it is made when a woman has a new baby. Literally finger-licking good! If using a tough meat like goat meat, place in the pot with water the same level as the meat and bring to a boil. When the meat boils for five minutes, add in the plantains. If using softer meat, perhaps a soft cut of beef, put it in the pot with plantains at the same time. 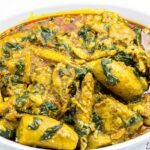 Once the plantain is in the pot, add in all other ingredients except the vegetable. Let it cook for about 30 minutes until the plantain is thoroughly cooked. Check constantly to see if there's a need to add more water. Now, add in the vegetables and let it simmer with the plantains for 2 minutes. Turn off the heat and serve warm. 1. No need to chop the vegetables used in this recipe. Amazing recipe as usual with beautiful pictures. I agree, fresh spinach or anything for that matter beats dried bitterleaf any day. I love palm oil and prefer it to vegetable oil sometimes. Some meals don’t just taste the same without “oyel”.? Nothing beats that taste of palm “oyel” in certain meals. It is EPIC! Thanks so much for your kind words, dear! 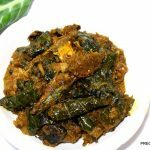 Precious if I didn’t know your nationality, I would have probably have mistook you for with either an Efik or an Ibibio woman because your recipes are similar to ours. Point stated, the title of this post made me laugh so hard at first. I have missed you here but hope you are doing fine? I know right! We are one, dear! Yes, I’m fine. Missed you too and thanks for asking. 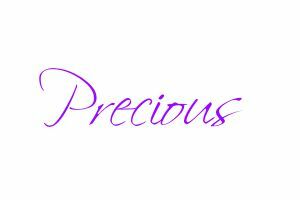 Hi Precious, i really appreciate how easy your recipes are to follow, they always turn out great. What happens if yellow plantains are used in this dish? Hi Claudia, glad to hear you love the recipes. Yellow plantains won’t actually work here because they will be mushy and sweet. Green plantains are the way to go. Yes, Cynthia I will definitely do that. Glad you love the recipes.